To touch, to move, to inspire. This is a true gift through podcasting. Modified from a quote I love by Aubrey Lynch on dance, but as applicable to podcasting. Be kind wherever you go. Kindness goes a long way. 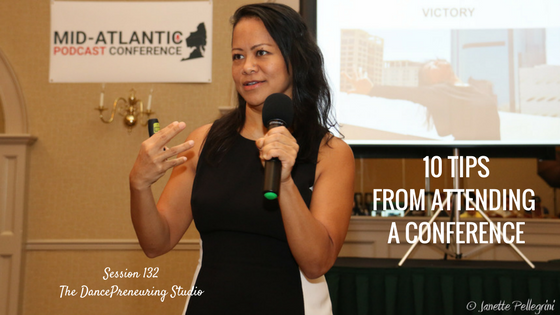 The main theme throughout the conference was embracing your authentic message through podcasting. Don’t try to be, simply be. This is also important in networking. Determine how you define connection. Staying in touch with social media? Waiting till another event? How is your follow up process? If a situation is draining you, remove yourself from it even if you can only do it temporarily. It’s not your job to try and make everyone like you. It’s your job to honor yourself and to connect with those whom you are supposed to make a connection with. Ask yourself:What is the quickest way to implement after you’ve learned? What makes the most sense to do next? Define your outcomes before attending the event. Take confident ownership of who you are and the value you bring. Anthony, MAPCON would not have been as special without you! You rock!